St. Petersburg, 74 Moika River emb. 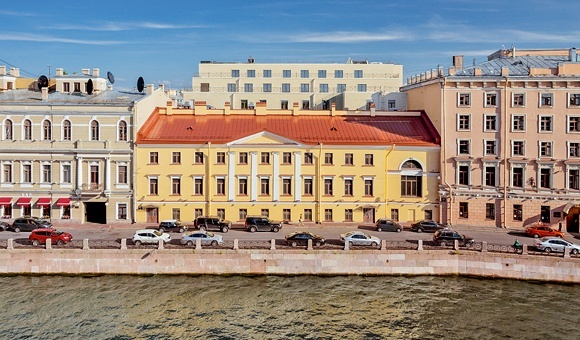 The “A” Class Business Center is located in the heart of St. Petersburg, on the Moika river, within walking distance from historic and business buildings: St. Isaac’s Cathedral, the Legislative Assembly Building, the Constitutional Court of Russia and Mariinsky Theater. Nearby are various banks, cafes and restaurants, hotels, shops and boutiques, sport clubs, culture and art centers. 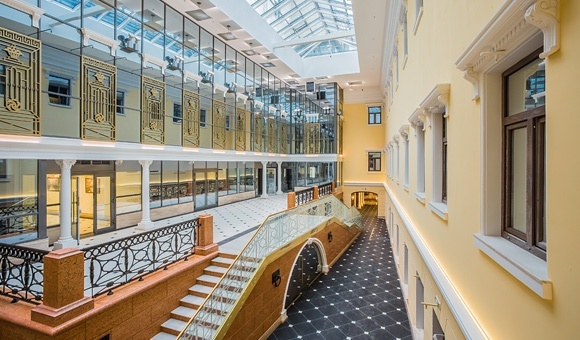 Moika 74 Business Center includes two buildings with a different numbers of floors: a historic building facing the Moika and the adjacent present-day building. Together, the two buildings form a courtyard. 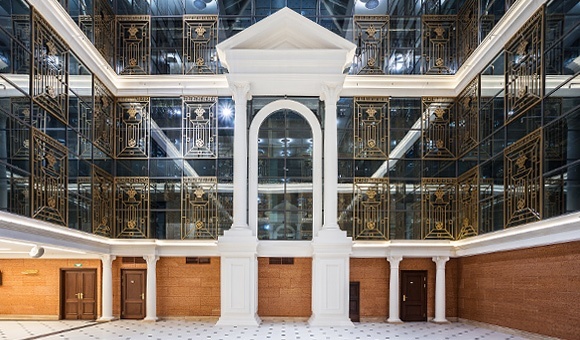 The historic 3-storey building is known as the State Supervisory Authority Building and is listed among the city’s cultural heritage landmarks. 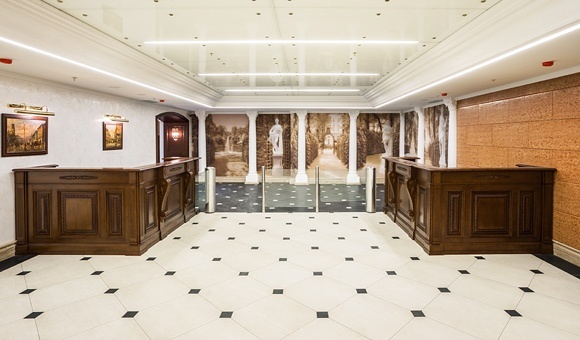 In 1963, the historic building underwent capital repairs with a change of the building layout, and in 2012, the building was reconstructed, with walls and the facade undergoing extensive repairs, and a new roof. The new building was completed in 2014. 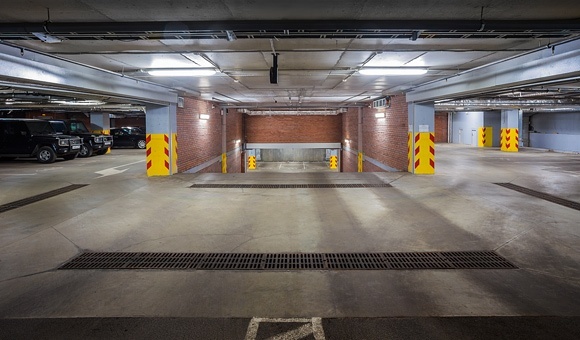 It is a modern 7-storey building with in-built underground parking for 120 cars, two spacious atriums and terraces, overlooking the Moika at the level of floors 5-7. The business center has been equipped with modern ventilation, air conditioning and heating systems, noiseless elevators, safety, video monitoring and access control systems. 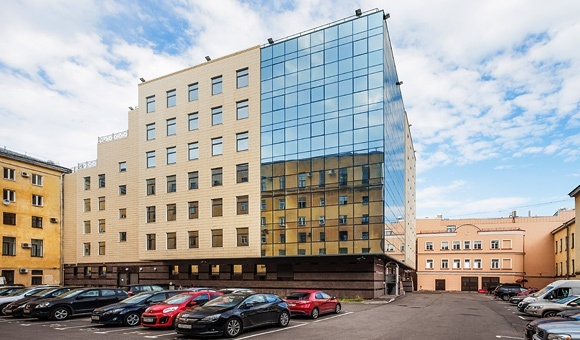 As the building of the Center is located next to major city thoroughfares – Voznesensky, Nevsky and Moskovsky Prospekts, as well near the Blagoveschensky (Leitenanta Shmidta) and Palace bridges, Pulkovo Airport, the Seaport of St. Petersburg, the resort district and other districts of St. Petersburg are easily and quickly accessible. The business center can be conveniently accessed from the Moika, Pereulok Pirogova and Fonarny Pereulok.